At 18 months, Kieran’s vocabulary is growing daily. He’s starting to put words together, and Bronwen and I get a kick out of him saying “No thank you” in his cute little voice.Sometimes, though, he has some problems with pronunciation. For example, “Pick me up” kinda sounds like “Peanut bup”. 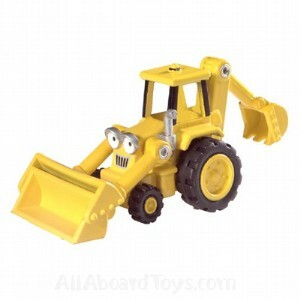 No big deal – we can understand most of what he says.Kieran’s favourite toy is a backhoe that he calls a dumptruck. However, “dumptruck” comes out as “dumb f*ck”. This leads to some great conversations in the car – “Daddy? Dumb f*ck. Mommy? Dumb f*ck”.So, if we’re visiting you at Christmas and he says “[insert name]? Dumb f*ck”, don’t take it personally, and don’t blame the parents. heeheehee. Ronan used say “Daddy’s f**ky”. Translation “Daddy’s coffee”. Can I borrow him for the weekend? I could have fun with this.